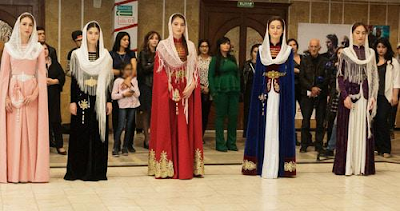 The works created by nine designers of Circassian costume from Kabardino-Balkaria and Adygea are presented at a show in the Nalchik Palace of Trade Unions. The designers believe the growing interest of young people in the Circassian costume makes it possible to say that the national clothes have a good future. The show organized by activists from the youth band "Nart Khaku" was held on September 27, on the eve of the Day of Circassian Costume. "As far as I remember, no interregional show of Circassian designers has ever been organized. And we decided to fill the gap," the "Caucasian Knot" correspondent was told by Astemir Shebzukhov, one of the show organizers. According to him, the number of the designers who presented their works includes experienced masters and beginners, for whom "the show is a good platform for showing their models." Bella Bodjokova told the "Caucasian Knot" correspondent that she has been modelling and designing Circassian clothes for seven years. According to her, she repeatedly took part in shows in Adygea and in other regions. The designer has noted she is inspired by her love for her people and culture. The Circassian national clothes have a good future, since it is becoming more popular among young people, Bella Bodjokova believes. Activists unite to revive Circassian horse breeding, In Nalchik, 50 children of Syrian repatriates take part in festive event, Nalchik: about 100 people come to opening of photo exhibition of Circassian national costume.